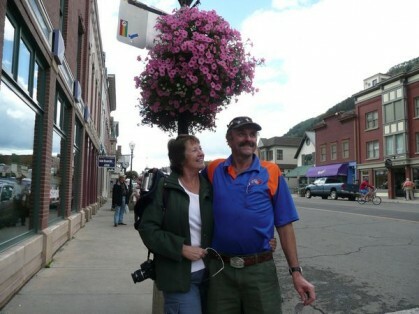 The two RVs did not leave Loveland with the tractors as Allan was recuperating from a virus infection and had medical advice to rest. 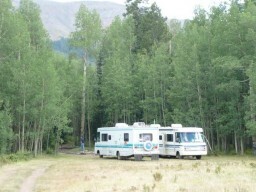 Also Ron’s RV was in need of some mechanical maintenance which needed to be carried out before heading over the Rockies. 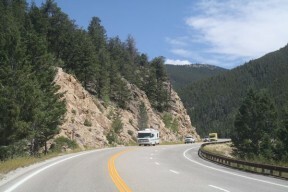 Allan was feeling well enough to travel again, so joined up with Ron in Denver and the two RVs headed into the Rocky Mountains. A chance meeting with a couple of local lads, Andrew and Scott, led to a suggestion to stay at the forest camp at Buffalo Peaks Wilderness. 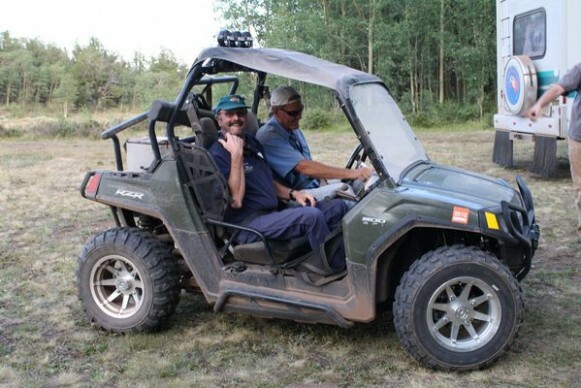 No sooner had camp been set up and a fire underway than the lads arrived in their all-terrain vehicle and took the Ron and Allan for spins which they thoroughly enjoyed. This was a wonderful place for a true getaway camp. After an early morning walk through the pristine forest, it was time to head off through the beautiful mountains again. 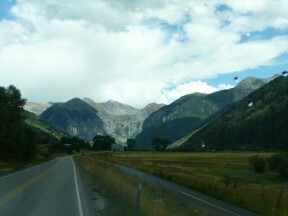 The route through the Monarch Pass (11,312 feet) to Gunnison was again picturesque with a new vista around each bend. A very pretty spot at the Red Creek Campground was a perfect place for an overnight stop. A walk from the camp led us to a beaver pond which, while the beavers were a bit shy of the camera, was a perfect example of their clever dam building habits. Word from the five tractors drivers is that they have decided to drive straight to Las Vegas and tour to the Grand Canyon from there, so the plan to meet up with them in a couple of days will not eventuate and we will continue at a leisurely pace, and catch up after we have visited the Grand Canyon. They were heading south from Salt Lake City this afternoon, en route to Cedar City and then Las Vegas. 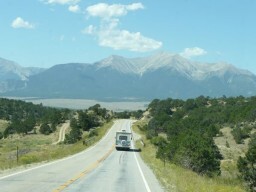 Continuing the trip through the mountains saw the RVs travel to Montrose, then through flatter country to the hills of Ridgeway. As we headed west there was a magnificent range ahead of us – the Uncompahgne Plateau. 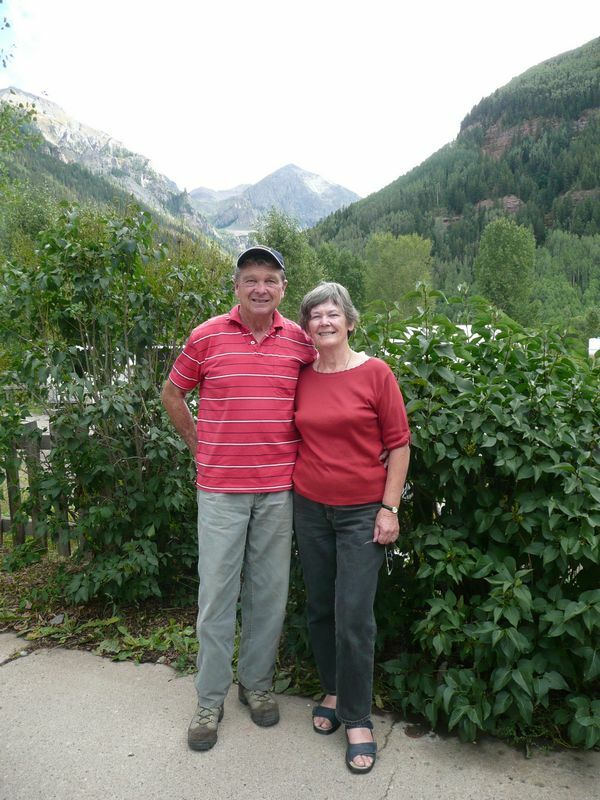 The scenery undertook a subtle change when we encountered the red hills of Placerville and headed towards Telluride. This village was another recommendation from the lads Andrew and Scott and our visit there turned out to be a real bonus. Not only was the town very pretty, but there was a gondola service up and over the mountain to Mountain Village on the other side and return, and this service was, unbelievably, free! The scenery was magnificent – Telluride is surrounded by mountains on almost every side and has ski slopes down many of these. The shops are touristy but quite delightful and the whole area has a wonderful European feel about it. To finish a really fantastic day, a decision to try out one of the local restaurants was a great success, the choice being Italian. The day started out showery but quite pleasant for the drive through the Lizard Head Pass which at 10,222 feet was dwarfed by the surrounding mountains which peaked at up to 14,000 feet . 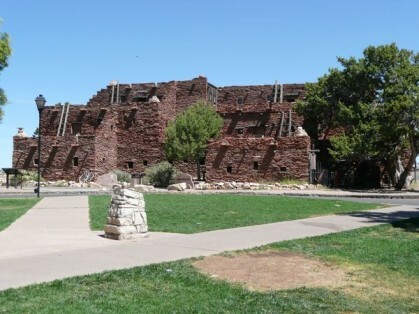 A visit to the Anasazi Heritage Centre was a very wise choice. 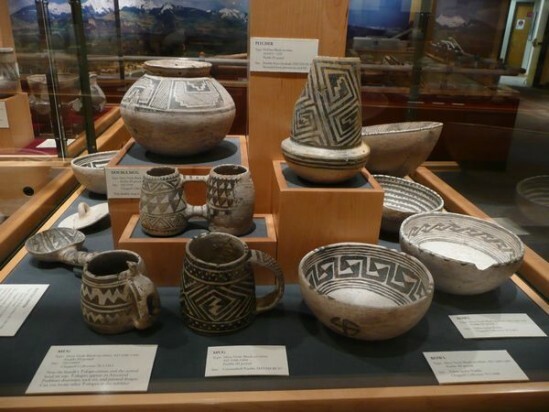 This centre focuses on the ruins found in the area of the Escalante Pueblo people and has a wonderful collection of artifacts as well as screening very interesting informative documentaries about the history of the original inhabitants and their way of life. A short walk leads visitors to some of the ruins which have been stabilized in an endeavour to prevent further deterioration. Any further plans for sight-seeing were changed when an electrical storm hit the area whilst we were at the top of a 8,500 foot mountain in the Mesa Verde National Park – it was quite spectacular but also dangerous as lightning was striking areas close by, necessitating a hasty retreat. 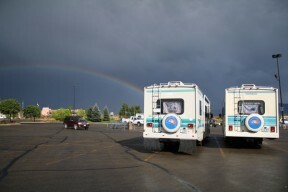 An early stopover was decided at Cortez, where a complete rainbow gave hope of better weather tomorrow! After attending to a few calls around Cortez, we headed south to a winery run by Guy Drew. Guy grows grapes in what looks like most inhospitable territory, but with plentiful water available by irrigation from the nearby river, he has remarkable success. His wines are all very palatable and his gardens are really very pretty. The house has been built from straw and has a wonderful Mexican feel to it and is beautifully appointed. Many other properties in the area grow grape vines on the ridges of rocky outcrops. The only other crops seen were irrigated Lucerne which is baled for stock feed. The border into Utah was crossed at lunch time and the countryside became quite desert like with only a few oil rigs and rocky outcrops to break the skyline. Then as we approached Bluff, the rocks changed colour to salmon pink and looked very fragile, with many breakaways obvious. The trip through the Monument Valley was absolutely breathtaking – so many rock formations in this Navajo country. No wonder so many movies have been made in this area – you expect to see an Indian jump out from almost every rock! We crossed the San Juan River and proceeded to where the Mexican Hat formation was clearly seen. A stop at a Navajo stall gave us an opportunity to see some genuine Indian craftsmanship and a very nice young lady named Marlena was happy to sell us some jewellery. 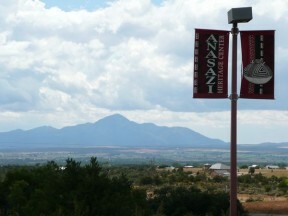 We crossed the border into Arizona late afternoon and continued to the overnight stop at Kayenta. From Kayenta we headed south west on US160 where the countryside was quite flat and rather greener. A good resealed road led us past another formation, the Elephant’s Feet, very aptly named. A morning tea stop allowed time to check out a Navajo Trading Post where many interesting items of Indian culture are stocked. The road continued into Cameron on 89 then 64 to Desert View where hills have again changed colour, this time to a very light shade. A stopover at the Little Colorado Scenic Lookout gave us our first view of the canyons and another opportunity to check out local wares. 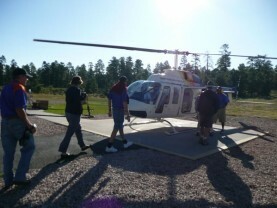 Then it was on to our destination for the day, the Grand Canyon. After a rather hot day, it was decided to leave the sightseeing until the morning and it was nice to relax at the Trailer Park and make arrangements for the next two days’ activities. There are days when one can tick an item off the list of ‘things to do before departing this earth’! This was one of those occasions – the Grand Canyon was high on the wish list and has not disappointed. In order to be at the airport for the planned helicopter flight, it was necessary to be up at 5.45am to arrive at the airport by 7.30am. This was achieved comfortably and the 8.00am start to the adventure saw everyone excited and ready to go. The flight took us over the northern end of the Canyon which was absolutely spectacular. To see the Colorado River so far below which looks like a stream but can be a ranging torrent, was quite fascinating. Once back on solid ground again, it was time to visit the inevitable gift shop and they really do stock very well priced prints of the Canyon as well as the photo to prove you really have made the flight. 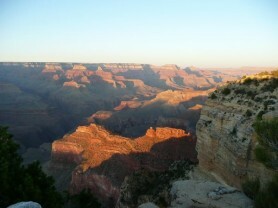 Next it was off to the Imax Theatre to see a National Geographic film entitled ‘Grand Canyon Movie’. This theatre has a screen seven stories high and the photography was so amazing that you could feel seasick just watching the white water rafting, and felt like ducking when the film crew flew so close to the towering cliffs. 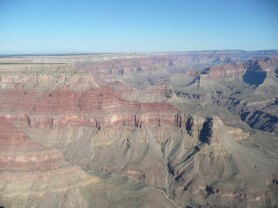 Having just flown over the Canyon, the film had very real meaning for us all. After all that excitement, it was time for a bit of R and R, chores etc before catching the local shuttle bus to Hopi Point to watch the sunset. The day was cloudless but the sunset was still amazing and the colours very much accentuated with the late afternoon glow. This has been a day our group will not forget. Three enthusiastic members of our group (we won’t call Ron a wimp!) 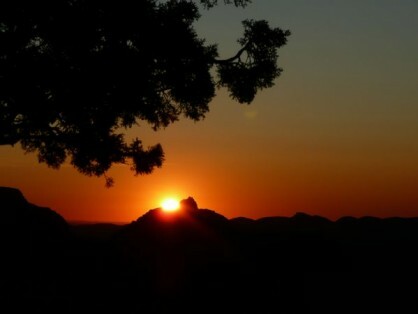 were up at 5.20am to catch the 5.45 shuttle bus to go and watch the sunrise over the canyon. What a wonderful way to start the day. Then around 7.00am we set out to drive to Williams, some 60 miles away, to catch the Grand Canyon Railway back to the Canyon. This was a trip back in time – this train journey had it beginnings back in 1901 when the first steam train took passengers and supplies from Williams, Arizona to the South Rim of the Grand Canyon. Many notable passengers of the day, including Presidents and Film Stars, made the journey before the service closed on 1986 and it was nearly 20 years before funds were made available to restart the trip which is now a very popular tourist service. The trip of just over 2 hours covered areas as diverse as high desert to prairie to pine forests, and guests were entertained along the way by musicians, including the violin player who invited guests to help him play his fiddle. Allan could not resist and was soon heard to make merry music! 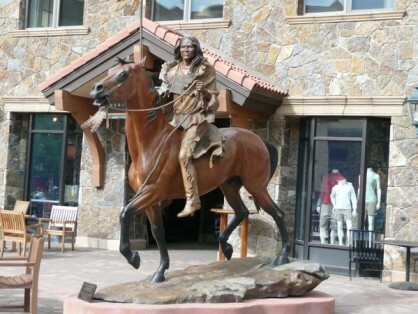 Once we had arrived back at the Canyon, we had the opportunity to explore an area away from where we had camped, and enjoyed a very pleasant lunch at the Arizona Restaurant, with huge picture windows overlooking the canyon. A short stroll to some of the local attractions and it was time to regroup for the return trip. 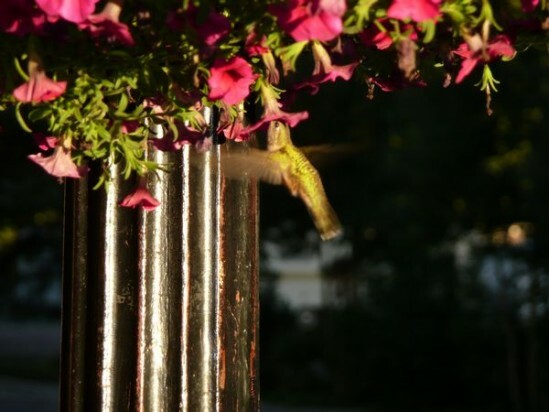 Once back in Williams, it was nice to relax and again enjoy a quiet evening meal together.